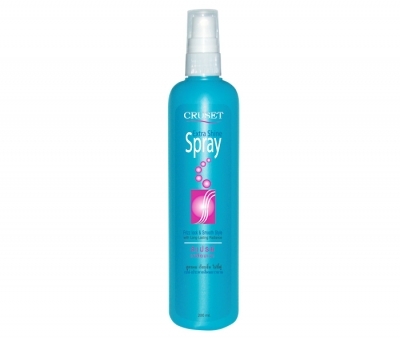 Cruset Extra Shine Spray 200 ml. 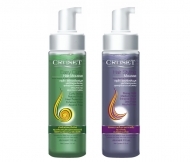 Cruset Extra Shine Spray 200ml. Frizz lock & Smooth Style with Long-Lasting Radiance. Exceptionally light and extra shine leave in hair spray that has been optimized to provide long lasting radiance to your hair color in whilst leaving velvet feel. Special blend of Wheat germ oil, Broccoli Seed Oil, Coconut Oil and Polysilicone-15 that give an extra nourish and moisture through your hair with heat and UV protection properties. The results of hair smooth softness, non-frizzy, easy styling and all day lasting radiance. Design for both normal hair and colored hair and can be use daily without tacky feel. 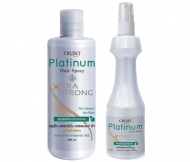 Cruset Platinum Hair Spray X-TRA Strong 220 and 400 ml.